Current commentators consider the combination of collisions, groundings, and senior reviews of 2017 to be a watershed event for the Surface Warfare community. Rather than a wakeup call for the community, 2017 should be viewed as a culminating point for the Surface Warfare community overall and the Surface Warfare Officer (SWO) culture in particular. Just as Napoleon’s policy objectives failed to bring Europe under his rule, despite brilliant military victories,1 many post-Cold War policy decisions for the Surface Warfare community, as admitted by past and current leadership, were misinformed. In some cases, they appear to have done more harm than good to the Surface Warfare community. More importantly, those changes in policy drove changes in the SWO culture. And, while many people debate the merits of some of those earlier policy decisions, the debate is lost in the fog and the SWO community is missing the real opportunity to reclaim its warfighting excellence by recreating the culture which led to victories within the last century in the same waters in which sailors died in 2017. By identifying the warfighting traits the community believes necessary to lead, fight, and win at sea, by developing a modern approach to promotions and assignment processes, and by leveraging readily available techniques and solutions in use by leading industrial sectors,2 the SWO community can return to a culture built on warfighting competence and professional proficiency – excellence – that it once exemplified as it stood as the premier community in the Navy. This is no small task. But it is readily doable and doable in short order. The national and global competition for talent in business, industry, and academia has driven the development of a variety of techniques and solutions to help organizations win the competition. Current techniques and solutions include compliance with federal and state job application laws, tailored machine reading, and the ability to develop specific questions or processes in an effort to find the right talent. Applicants build their profile and post or submit their resume. Depending on the traits the customer is looking for, applicants are screened. If their profile and resume are assessed to not meet the desired factors, applicants are notified by email that they are no longer needed to participate in the screening process. Or, if they score high enough, applicants may be required to participate in another level of screening in the form of a battery of questions or other online exercises – all before a single human has reviewed their submission. Of course, articles abound about how inhuman and unfair the process has become. However, more and more talent is migrating to these online processes to find employment and more and more organizations are paying for these services in order to win the competition for talent. These existing techniques and solutions could be applied to improve and align warfighting skill sets and proficiency for the SWO community. For starters, past naval heroes were not rated by the same processes used today. However, unstructured data in the form of biographies, articles, battle reports, and other sources can be processed using current cognitive processing methods to glean or extract a set of character traits common to those past naval heroes deemed to have exhibited warfighting excellence. In parallel, a cadre of junior officers, with very few select retired flag officers as advisors, can separately develop a set of warfighting traits.3 It is essential that the ideal of warfighting excellence is captured by this group. Once both sets of warfighting traits are generated, they are then synthesized into a single warfighting trait model that would exemplify an individual with premier warfighting excellence. With the ideal trait model in hand, the Surface Warfare community can then embark on “scoring” individual warfighting proficiency reflective of its officers’ performance. Returning to warfighting excellence to reinvigorate and restore the SWO culture may necessitate a reconsideration of not only the factors by which warfighting excellence is determined but also an expansion of the data set from which those factors are pulled. The existing performance evaluation system and its fitness reports, and how they are used, do not meet the need and do not drive warfighting excellence. Fitness reports serve a purpose and can continue to serve as one source of data for an officer’s performance. However, there are a myriad of unique and high performing skills demonstrated daily in the fleet. Yet, the proficiency with which those skills are performed is not assessed or recorded. Reportedly, every landing onboard an aircraft carrier is an opportunity to rigorously and objectively score the pilot’s performance, and provide critical feedback in the performance of this critical warfighting skill. The Surface Warfare community should immediately adopt an approach similar to that used by Naval Aviation. For example, the shiphandling skills necessary to get a ship underway may be observed or scored during the Basic Phase or periodically in a simulator, but there are dozens more special details which are not required to be scored. Similarly, ships routinely go alongside for underway replenishment, but this opportunity is lost for assessing shiphandling proficiency. In a healthy command, the plan-brief-execute-debrief (PBED) process is alive and well, but scoring against community-wide professional standards does not exist. Establishing such standards and scoring an officer’s performance to those standards would contribute to establishing officer’s warfighting capability and proficiency scores. 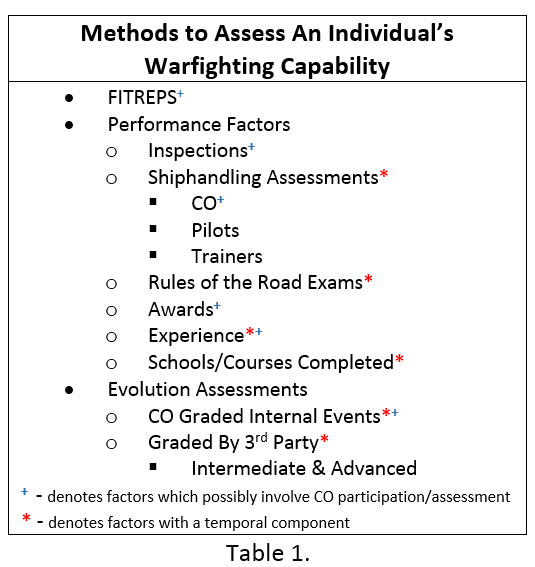 Table 1 lists some of the means to establish an officer’s warfighting scores. Some aspects of the warfighting scores would necessarily have a temporal component as proficiency degrades over time, especially time spent away from the waterfront. For example, an Executive Officer (XO) who last took a ship alongside for replenishment at sea four years ago would (and should) have their warfighting capability score appropriately degraded. All things being equal, the XO who went alongside yesterday is likely to be much more proficient at that skill than the XO who went alongside four years ago. Consider other Navy communities such as Explosive Ordnance Disposal (EOD), Divers, and Aviators. They all have skills that have an “expiration date.” In order to maintain proficiency and prevent triggering a requalification requirement, the skill must be demonstrated at some objectively established periodicity. While the periodicity can be lengthened such that the importance of the qualification is diminished, it must be a consistent standard to restore the warfighting excellence of the SWO community. If maintaining proficiency in basic shiphandling evolutions really is important to the SWO profession and culture, then SWOs will necessarily spend some of their shore duty in shiphandling simulators for their periodic assessments and community leadership will resource the requirement. Going to the Joint Staff for a 22-month tour will not be an excuse for not maintaining proficiency in warfighting skills. 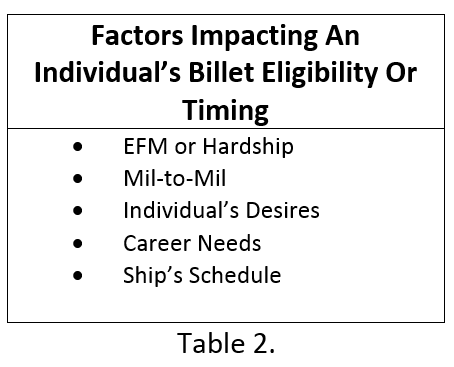 Also listed in Table 1 are those methods that are available to and fully within the purview of a ship’s Commanding Officer (CO). This should help alleviate any concern the community might have on eroding the CO’s ability to lead or develop their wardrooms. While most of the methods are self-explanatory, it should be noted that the scores achieved during the Basic Phase are absent. Fundamentally, the Basic Phase is a training event. As such, introducing those scores into an officer’s warfighting capability score could diminish the training opportunity. In other words, activities that are primarily for training must be treated as such allowing mistakes to be made and learning to occur without concern about an officer’s warfighting capability score. Additionally, a CO’s assessment averages, just as with fitness reports, would need to be tracked as a forcing function to prevent inflating scores. As an officer approaches a career milestone, such as a selection board or a slate, their warfighting capability score firms up and is then compared to the warfighting trait model. It is this comparison that determines their ranking within their respective cohort. For a selection board, this rank determines whether or not they are selected. Gone are the days where careers are determined by a system which is “as fair and unfair to everyone equally.” A bad briefer will not send the community’s best to “the crunch.” The Board members will know the warfighting trait model and they will be able to see the officer’s score against that model. They will see the score trends over a specific assignment and throughout the officer’s career. This way, warfighting competence and professional proficiency become the primary determinants for selection and assignment. While most of the discussion has been focused on the determination of an individual’s warfighting capability score and proficiency, similar approaches can be used to assess shipboard teams and the ship as a whole fighting unit. Another benefit of knowing an individual’s warfighting capability score is developing slates which better support the fleet’s warfighting readiness needs by ensuring a ship’s overall warfighting capability score remains above a minimum level through slating officers to that ship using their warfighting capability scores.4 Consider that when a group of individuals come into their slating window, their warfighting capability score is again determined. The group is then ranked and divided into top, middle, and bottom thirds (or quarters). For example, a prospective Department Head who ranks in the top quarter will get slated to a ship where the current Wardroom’s overall warfighting capability score indicates they could use some talent. Of course, there is risk that an officers’ duty preferences will not align with the fleet’s needs, but that issue exists today and will continue to require the same quality engagement by community leaders. Detailers will still need to understand factors listed in Table 2. While Table 2’s factors are important to an officer’s quality of service, they are not factors for determining warfighting excellence. By grouping a slate by quarters or thirds, flexibility is created which allows accommodating factors in Table 2. But, the entering argument for the entire officer slating process is warfighting capability and professional proficiency. 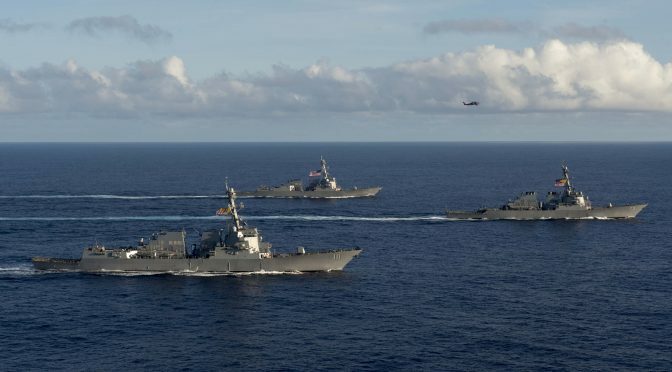 The existence of a strong, objective warfighting excellence scoring system would allow the Surface Warfare community to manage warfighting capability within individual ships and across the fleet. It will provide a means by which the performance of individual ships and the fleet can be improved. The process of driving the SWO culture back to warfighting excellence and professional proficiency will be challenging and there are those who will fight the change tooth-and-nail. Senior officers will see this as an attack on “their Navy.” Detailers will see this as a challenge to their primary activities. Senior mentors and advocates will see this as an affront to their mentoring and their confederation of mentees. Some will see this approach as a challenge to various support organizations external to DON, such as the Surface Navy Association. Many will immediately start looking for ways to game or manipulate the system, eroding its effectiveness. These things must be anticipated and guarded against as a new process that attempts to change culture will have to face friction posed by existing culture. 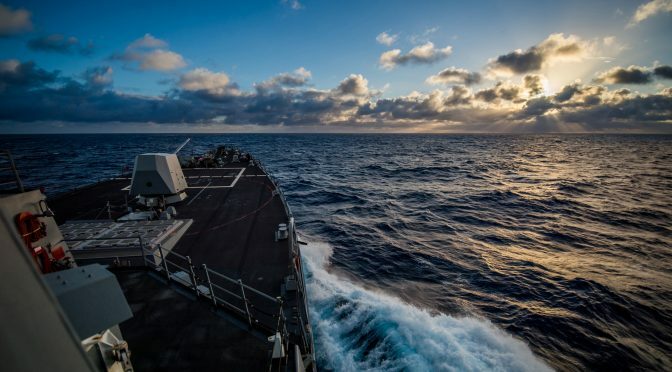 If SWO warfighting excellence is the reason that the Surface Warfare Community exists, and if warfighting competence and professional proficiency is the critical need for the current and future maritime warfighting environment, the SWOs must rise to the challenge. By leveraging modern techniques and solutions to develop an objective and rigorous system of assessing warfighting capability for SWOs throughout their career, and by using the warfighting capability scores to make warfighting competence and professional proficiency the centerpiece of promotion and assignment, the SWO community will realize its greatest potential and return to a level of professionalism not seen since the end of World War II. Themistocles is a pseudonym whose choice is intentional in order to focus on the subject of the article rather than the author. There is also the parallel in the choice of Themistocles that, while some of the ideas presented may not be popular with the establishment, the discussion and discourse prompted by these ideas may again assist in establishing the preeminence of the naval power of the world’s greatest democracy. Statements and opinions expressed in this article represent personal views and not that of the DoD or DoN. Weldman, Thomas. War, Clausewitz and the Trinity. New York: Routledge, 2013. Weldman, War, Clausewitz and the Trinity, 79. While there is a vibrant debate about what is and what is not ‘artificial intelligence’, ‘machine learning’, and other relatively new terms, this paper focuses on the fact that there are modern techniques and solutions available rather than attempting to define terms which are new, changing and not yet agreed upon by the wealth of experts debating them. The involvement of and control by current flag and senior naval officers in articulating this set of warfighting traits must be purposefully limited so that an independently developed set of traits can be achieved. The concern is that traits which may have contributed to the current culture will be captured inadvertently. Additionally, the flag officer advisors’ role is to guide the junior officers and constructively challenge their ideas to strengthen their product. The flag officer advisors to have no veto over or approval authority regarding the junior officers’ results. A unit’s overall warfighting excellence score has further implications in how and when they are employed by operational commanders. However, those possibilities are not discussed here in order to keep the discussion focused on improving the SWO culture. The distributed lethality concept represents a distinct change in Surface Navy operations, one that emphasizes the offense, and one that requires the freedom of action only possible under mission orders. Both place heavy reliance on the Surface Action Group (SAG) having information superior to that of the enemy in order to be hard to find and thus avoid attack and achieve the offensive advantage of surprise. This is enabled in large measure by situational awareness: the warfare commanders’ perception of the tactical situation. It is achieved by the continuous collection, correlation, fusion, assimilation and interpretation of information from force organic systems, and nonorganic national, theater, and Navy systems. A core element of the distributed lethality concept is that SAG commanders operate under mission orders that allow them the freedom to make tactical decisions, a major change away from the long-standing convention of detailed direction from higher headquarters located ashore or on a CVN with its substantial tactical intelligence decision support capabilities. 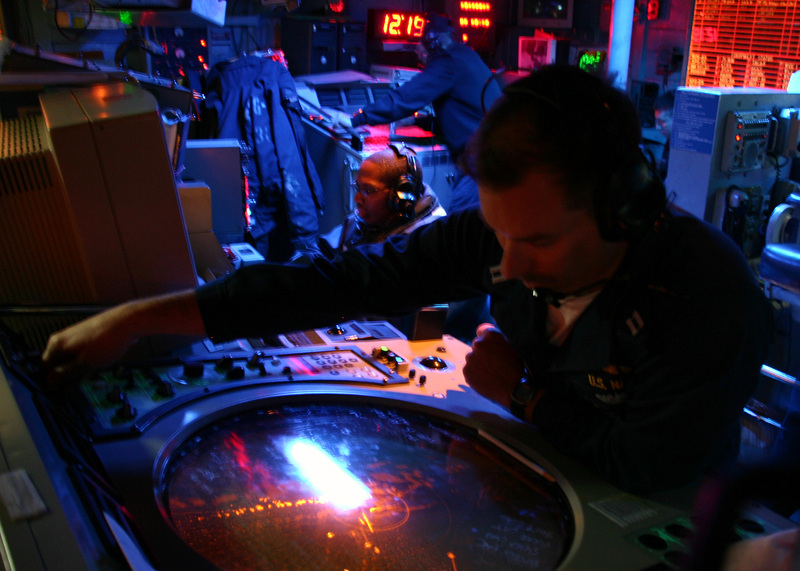 Consequently, the surface navy has had no driving requirement for the sophisticated Common Tactical Picture (CTP)1 or “plot” capabilities that are now required onboard surface combatants for the situational awareness required for the planning/re-planning, and tactical execution of distributed missions. When viewed together, NWP 3-56, NWP 3-13, and NWP 2-01 suggest that the Navy needs a concept and coherent allocation of responsibilities for developing and maintaining the CTP, especially as it applies to a SAG operating in EMCON while executing mission orders. 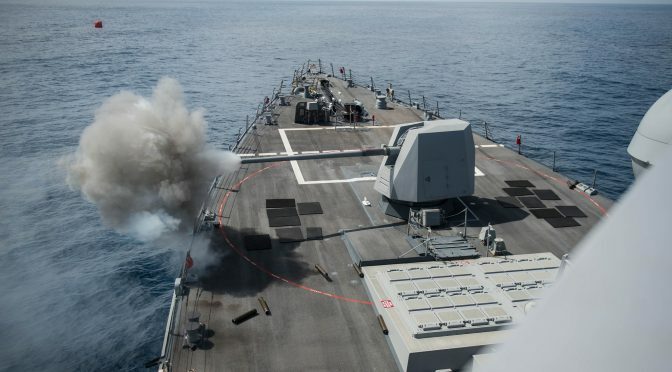 Changes to current Navy doctrine to accommodate the concept of distributed lethality will be driven by at least two factors. First, to achieve the surprise that is essential for distributed lethality mission success, the SAG will have to operate in RF silence to deny the enemy the opportunity to detect the force with passive RF sensors, one of the primary methods for surveillance of large areas to gain initial location and classification of detected units. All communications to the SAG from supporting entities will have to be routed to and disseminated via narrow and wideband satellite broadcasts such as CIBS-M and GBS. In effect, the SAG gets all the shore support while remaining hard to find thereby minimizing risk of attack. Second, the surface navy will have to develop and field intra-SAG communications that are sufficient to command and control the force and maintain the CTP but covert enough to minimize the probability of detection and location by the enemy. Third, surface combatants have neither the space nor the systems to support the large intelligence presence such as that found on a CVN or other big deck. This suggests that when in EMCON, the SAG will be more heavily dependent on tactical intelligence provided from shore. Some sensor information such as combat information5 cannot be processed ashore into tactical intelligence in time to meet SAG requirements. Therefore, SAG combatants will require dramatically improved capabilities for automatically integrating tactical intelligence, combat information, and organic force sensor information. Given the criticality of time in tactical decision making, automated information correlation and fusion capabilities are essential. However, their output is never perfect or complete so the crew will have to have the skills, knowledge, and abilities to analyze and resolve ambiguities and conflicts. Distributed lethality depends on being hard to find and securing the element of surprise enabled by superior situational awareness. With the adoption of the distributed lethality concept, it is essential that the concept and doctrine for establishing and maintaining the CTP be reviewed and optimized to assure warfare commanders enjoy the tactical advantage of decision superiority over an adversary. The clear assignment to the shore intelligence structure of responsibility for the accuracy, completeness, and timeliness of tactical intelligence support to the SAG would result in renewed focus on tactical requirements and renewed appreciation of the critical importance of the clock at the tactical level. Moreover, it would drive a new hard- edged fleet focus on the ability of shore-based tactical intelligence support elements to provide this mission-essential support. The clarification of responsibilities onboard ship for maintaining the CTP would serve to focus attention on the ability of those responsible to maintain situation awareness that comports with the realities of the operating environment. As shortfalls and opportunities are identified, the fleet would refine its requirements for the manning, training, and equipping of surface combatants to achieve the information superiority that is the key to mission success. As stated by VADM Rowden in the January 2017 Proceedings: “The force we send forward to control the seas must be powerful, hard to find, hard to kill, and lethal. These are the bedrock tenets of distributed lethality…” The concept has gained wide support in the surface navy and is being adopted as a broader Navy operating concept. Rapid progress is being made by the surface navy under the leadership of the surface warfare Type Commands and OPNAV N96. Changes to doctrine to accommodate command control of operations on mission orders are being investigated. Surface forces are being up-gunned to be more lethal. 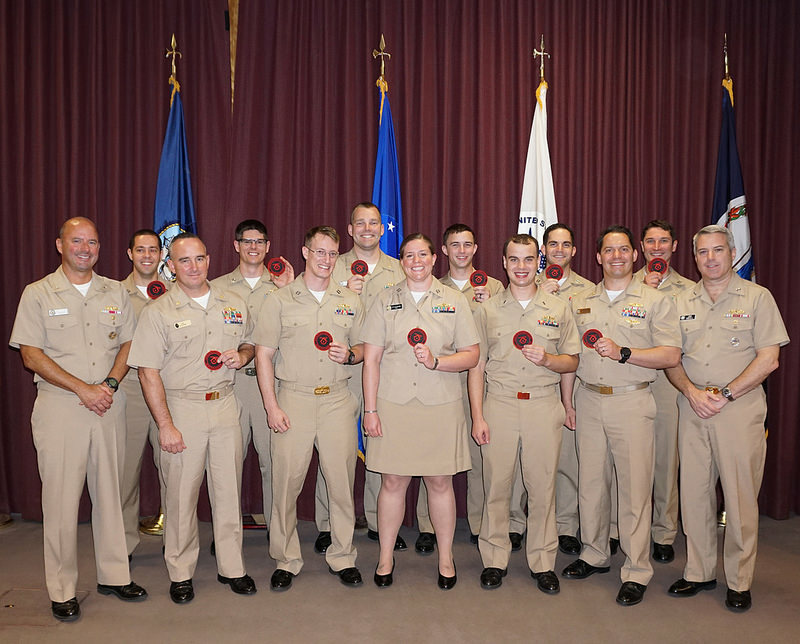 Surface Warfare Officers are being trained and developed as warfare experts for air, surface, and ASW at the Naval Surface and Mine Warfighting Development Center. This beehive of activity is resulting in rapid progress in all warfare areas except for Information Operations. Progress in this fourth foundational warfare area remains in limbo, owed in large measure to unaddressed OPNAV and Type Command organizational relationships and responsibilities for manning, training, readiness, equipping and modernization of the fleet for the planning and conduct of Information Operations. 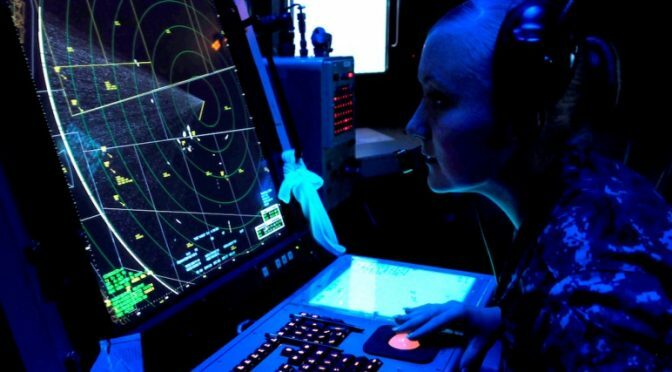 In the absence of progress in this warfare area the success of the distributed lethality is at risk against any near-peer nation with a sophisticated ISR capability. Richard Mosier is a former naval aviator, intelligence analyst at ONI, OSD/DIA SES 4, and systems engineer specializing in Information Warfare. The views express herein are solely those of the author. 2. IWC in NWP 3-56, NWP 3-13, and as used in this article is the Navy’s abbreviation for Information Operations Warfare Commander. It shouldn’t be confused with the Navy’s use of the same abbreviation to denote the Navy’s Information Warfare Community. We need greater specialization in our Surface Action Groups. We don’t need more tight ends. We need wide receivers who can block and tackles who can catch a pass. These specialists with overlapping mission capabilities will create a more potent offensive force whilst maintaining an appropriate defense. The primary unit tasked with maintaining air superiority will not have to waste precious magazine space beyond minimal anti-surface capabilities because the ship entrusted with that mission area will have the equal and opposite armament to compliment his counterpart. The SAG must be modular and scalable to support the mission objectives laid before them. As easily as a coach can substitute a player, the Navy, too must be ready and flexible. With each ship’s warfare focus clearly defined, commanders will have the ability to add or subtract specific vessels in support of various mission sets and theaters of operation. Assets can be scaled up or down and allocated according to the tactical needs the mission warrants. Every warship will be commanded by a Weapons Tactics Instructor (WTI). Much like a marine and his rifle, these next generation warriors will be intimately familiar with the weapons they command. The WTI program, although still in its infancy, is guiding the Navy back to its tactical roots. It will create leaders tactically proficient in air, surface, and subsurface warfare areas that will be force multipliers for a SAG. These individuals must be identified and directed towards commands that will capitalize upon their knowledge and skillful utilization of the warship’s capabilities. The Integrated Air and Missile WTI will command ships tasked with air supremacy, the Surface Warfare WTI will command the seas, and so forth with the other WTIs and their respective mission areas. With the increased potency of our offensive capabilities, specialized individuals must be assigned and prioritized to relevant commands to ensure maximum effect with regards to possible kinetic solutions. There must be no wasted Sailors, ships, or munitions in the war to come. We require individuals in our SAGs who can utilize their weapons to the fullest potential. The cruiser will be the de facto SAG leader and primary air coordinator. With its combat suite optimized for an additional command detachment and enhanced command and control capability, the cruiser is a natural choice. Its additional Vertical Launch System cells and fourth Fire Control illuminator make it ideal for ensuring air supremacy for the rest of the SAG. No fewer than two destroyers will accompany the cruiser to bolster air superiority, and to ensure surface or subsurface dominance. They will be specifically configured based upon their warfare specialty and the requirements dictated by the mission and surrounding elements. We need appropriate magazines for these warriors to employ. The primary unit tasked with Air supremacy cannot afford to waste VLS cells on land attack missiles just as the primary Surface commander cannot sacrifice their anti-ship missiles for air beyond the minimum needed for self defense. While a Swiss Army knife is useful in its function, one would never build a house with it. There is a reason the hammer has been invented. It is the right tool for the right job not just a tool for a job. With the continued proliferation of unmanned vehicles, it will be necessary for an amphibious ship be attached to the SAG as both a staging platform and an invaluable battle force multiplier. The amphibious ship can host the unmanned complement to each specialty commander’s tasking. Instead of Marines and their supporting vehicles, the well decks will be filled with unmanned sub and mine hunters, as well as anti-surface vehicles for use by the SAG’s surface and subsurface commanders. The flight deck will be filled with drones controlled by the air commander. In a war of attrition, these assets will enhance survivability of blue units while increasing lethality to red. Lives need not be unnecessarily risked when we have machines to employ in their stead. The SAG will be given dangerous and pivotal missions in which their tactical ability will need to be without question in an environment where they will take casualties both to personnel and equipment. The amphibious ship will carry reserves of both to ensure the SAG can remain on station. The abundance of drones will supplement the numerically small yet heavily-armed ships comprising the SAG. In a world defined by the electromagnetic spectrum, it is no longer enough to attack the equipment. A SAG commander must be continually aware of and decide how to tactically manipulate their profile in a communications-denied and emission-controlled environment. We must instead aim for the operator interpreting the equipment’s reports. Technology will reach a limit where we can no longer overcome it with other technology. It will then be a matter of influencing the perception of the individual making decisions based on the information they receive. When the enemy is searching for a small contact they may pay not attention to the large ones. A single destroyer with the radar cross section of a tanker traveling along shipping lanes warrants no second thought compared to the apparent squad of rowboats making a trans-Pacific journey. The enemy is looking for strike groups spread over hundreds of miles communicating on every frequency at their disposal and radiating each radar to its full capacity. We must use this knowledge to our advantage. In this regard, an Information Warfare commander will take on greater responsibility for not only individual warships but the SAG as a whole. In concert with Air, Surface, and Subsurface commanders, the IW commander will coordinate the electromagnetic activities of the SAG while monitoring the perception of enemy operators. This warfare area is important for attacking left of the kill chain as the WTI are for attacking right of it. Because of this importance a greater weight must be placed upon IW and experts should be at the forefront in training other warfare commanders on how to fight effectively in the dark. While doing this, we must continue to operate as our opposition expects as long as peace allows while training for the eventuality of never being afforded this luxury again. The enemy has been lulled into a safe pattern of recognition due to our over-dependency on our once superior technology. While propagating this impression, it is essential that we develop our ships into perceptual landmines. A single mine found can guard an entire field or waterway and is the quintessential Occam’s Razor of Anti-Access/Area Denial. A warship, completely invisible to the electromagnetic spectrum, capable of unleashing devastation before disappearing once more, will shut down entire sectors of the ocean and control the seas through even the rumors of its presence. There will come a point where modern technology will fail us in our mission. The SAG that trains for this and draws upon antiquated techniques of navigation and war fighting will dominate the seas. It is important now to project our power and run up the score to ensure this team cannot hang with us until the fourth quarter. There is nothing wrong with the traditional SAG or the tight end, but he needs a specialized, supporting cast to win decisively. The Navy requires a wide receiver who can catch the long ball when the defense stacks the box and a fullback who can drive it down their throats when the defense shifts to compensate. While the tight end is a key player, rarely has a defense needed to plan their game around one. We too must divest ourselves from this safe yet unimaginative playstyle while not abolishing it completely. We require specialty players who can keep the enemy off balance and force them to adjust their defense. No longer can there be a generic force presented for the opposition to send generic units in response. That’s too easy and too safe. We project the exact power we want them to counter and dictate the pace of play accordingly. Our high impact players will keep the opposition reliant upon us for operational cues until we have ripened the battle space for the traditional tight end to deliver the killing blow. Their continued failure will promote uncertainty and further reinforce our sea power dominance moving forward. LT Jon Hill is the Fire Control Officer onboard USS Bunker Hill (CG 52). The opinions and views expressed in this post are his alone and are presented in his personal capacity. They do not necessarily represent the views of his ship, the Navy, or the Department of Defense.